Bold, warm colours and sharp, geometric forms are the hallmarks of a Mediterranean garden. Inspired by the lush landscape of the coastal regions of Greece, Italy and Monaco, Mediterranean gardens evoke feelings of warmth and tranquillity. Think warm summer breezes and fine wine with friends as you bask under the Sicilian sun. If you want your own little patch of paradise right at home, try incorporating Mediterranean design elements into your garden. It offers just the right mix of style and functionality, perfect for those who enjoy a blended indoor and outdoor lifestyle. Perhaps the most striking feature of a Mediterranean garden is its robust use of stone, tile and other hardscape elements. Colourful tile work and delicately wrought iron filigree, often in the shapes of flowers and trees are a mainstay of this landscaping style. Tiles typically feature splashes of red or blue, with strong lines and dizzying geometric patterns. Stone walls, tiered patios and winding, asymmetrical pathways cut through the vegetation for a striking contrast of colour and texture. The use of gravel and pebbles is also quite common, creating clear boundaries between the functional areas and the garden beds. Mediterranean gardens often feature beautiful trees that are native to the area. These include trees and shrubs such as cypress, olive, palm and oleander. The trees are carefully trimmed and pruned to keep them lush and healthy. They tend to complement the hardscape, sometimes nestled against a wall or lined up neatly along the path. It is not uncommon for smaller trees to be kept in pots and other containers. The Mediterranean area is famed for its deep-rooted culinary history, with bold flavours and a profound respect for fresh ingredients. It is, therefore, no surprise that herb beds are a mainstay of the Mediterranean garden, lined with neat rows of thyme, basil, oregano and parsley, among other culinary favourites. These plants are as delicious as they are beautiful and wonderfully fragrant as well. They are perfect for those who love to cook or enjoy homemade herbal teas. Succulents and other drought resistant plants are common in Mediterranean gardens due to the area’s hot, dry summers. Succulents are not only hardy but add another layer of interesting textures to complement your garden. They have fleshy, sometimes spiky leaves and symmetrically arranged foliage, which go well with the geometric patterns of your tile work. Succulents also have cooler colour palettes — shades of silvery grey, blue-greens and purples are not uncommon. Some examples include aloe, agave and echeveria. Evergreens, on the other hand, do well both in containers and gravelly soil. Like succulents, they have varying shades of greys and greens. Perhaps one of the most popular of the Mediterranean evergreens is the lavender, famed for its beautiful clusters of purple flowers and its rich, heady scent. Mediterranean gardens tend to be more compact than other garden styles. Compared to other types of gardens that feature lawns and other wide, open spaces, these spaces are instead covered with a dynamic arrangement of plants and decorative ceramics. Large areas will have an artful mix of big and small plants in different colours and textures. Ornamental grasses, unlike lawn grasses, tend to have longer leaves and unique colours. They are not the type of grass that is tread upon and are more at home in a planter or pot. Blue fescue, for example, has a striking silver-blue colour. It grows in round clumps and is a popular accent plant in landscaping arrangements. Many ornamental kinds of grass and succulents will also be covered in a thin, white fuzz that readily catches the sunlight. This gives the garden an unusual, shimmering appearance that mirrors the sparkle of the Mediterranean Sea. Mediterranean ceramics are famed the world over. Terracotta earthenware, stone vases and elegant urns are all at home in this type of garden. Potted plants serve as a focal point for your garden and are ideal for growing delicate, ornamental shrubs. Potted plants are available in all sizes, but in Mediterranean gardens, will tend to be a permanent fixture. Large stone pots holding small trees and shrubs are quite common, and add a unique character to the garden that sets it apart from other landscaping styles. Al fresco dining is deeply entrenched in Mediterranean cultures. The area’s relatively warm climate makes it ideal for outdoor dining, and gardens will often feature al fresco seating and picturesque pergolas. Pergolas are a type of outdoor structure that consists of a roof and supporting columns. They are often constructed out of wood rafters, with either stone or wooden columns. Pergolas provide shade from the harsh sun and add a certain structural beauty to the landscape. They will often be covered in ornamental vines, such as wisteria, jasmine, morning glory, grape vines or trumpet creepers. Many ornamental vines feature cascading blooms in vivid colours, which greatly enhances the beauty of your pergola. It makes for a truly unforgettable dining experience. Raised garden beds are a must in any Mediterranean garden. Many native plants of the region prefer well-drained sites and thrive best in the moderately dry soil, which a raised garden bed can provide. They also create an attractive break in the landscape, which adds visual interest. You can also let flowers and grass spill over the edge of the raised beds to give it a more organic feel, balancing out the straight lines and geometry of the hardscape features. 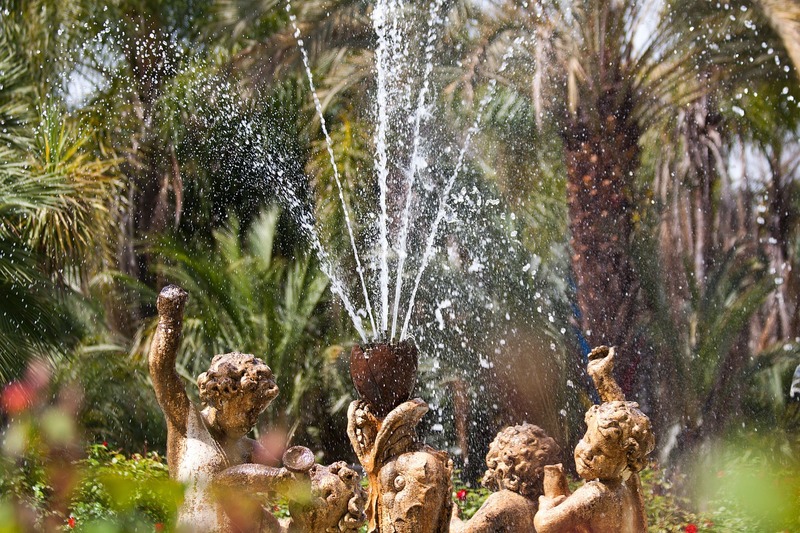 Though not a necessity, many Mediterranean gardens have elegant water features. Fountains, ponds and mosaic pools all provide relief from the hot, dry summers of the region. The sound of trickling water can also be quite musical, providing a respite from the din of urban life. These water features are popular with many garden creatures as well — birds, dragonflies, and butterflies are drawn to the cool, refreshing water. The Mediterranean garden is a perfect marriage of colour and form. Here at Oakleigh Manor, we can help you bring your vision to life for your own little patch of paradise. Visit us today and enjoy the best of landscape architecture and garden design.